One of the secret weapons of World War II first came to light after two men stumbled across a strange object in the woods of western Montana. On Dec. 11, 1944, two loggers were cutting timber at Truman Creek, southwest of Kalispell, when they found the wreckage of a huge, cream-colored paper balloon, painted with a green rising sun and Japanese characters. An alert newspaperman in Libby heard of their discovery and printed the news. Within days, Time and Newsweek picked up on the story of this latest Japanese invasion threat, and the secret was out. The FBI arrived to investigate the balloon found near Kalispell, and admitted that similar balloons had recently been found in California, Hawaii, and Wyoming. The balloons, which carried small incendiary bombs, were designed to start devastating forest fires throughout the West. They represented a desperate attempt by Japan to damage the U.S. economy, and divert military personnel from the battle front into firefighting. In order to keep the Japanese from learning the success or failure of their secret campaign, a news blackout was quickly imposed. Most Americans remained unaware of the extent of the Japanese balloon bomb campaign until the end of the war. U.S. authorities reinflated this Japanese balloon to test its capabilities. The first “Fugo” balloons were launched from the Japanese mainland in November 1944. The balloons were constructed of rice paper coated with paraffin, or tightly laminated mulberry tissue paper, glued together with potato paste. Many of the balloons were made by Japanese schoolgirls. When fully inflated, the balloons were more than 30 feet in diameter, 70 feet high, and had a capacity of 18,000cubic feet of hydrogen. They were capable of carrying 800 pounds of cargo, which normally consisted of 31 small sandbags (for ballast)plus four small incendiary bombs and one larger high-explosive bomb. 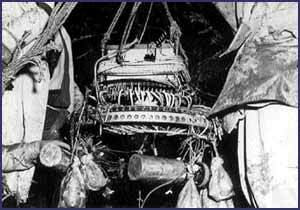 Ballast and bombs hung from an aluminum wheel below the balloon. 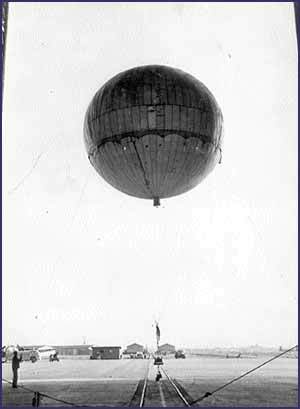 In the case of the Kalispell balloon, the bombs had already been dropped when it was found. The Japanese depended on what was then a little-known meteorological phenomenon known as the jet stream to carry the balloons eastward over the Pacific. The balloons were designed to fly at 30,000 feet, and were equipped with a barometer and a simple mechanical device to drop the ballast and bombs. Every time the balloon dipped a few thousand feet, a sandbag was released, and the balloon again ascended. When all of the sandbags were expended, the balloons began to drop their bombs. The mechanism of a recovered Japanese balloon. Although more than 9,000 balloons were launched, less than 400 are known to have reached the West Coast. Carried by the high-altitude jet stream, the balloons were found from Alaska and Western Canada to as far south as Mexico, and as far east as Michigan. Although the balloons were very ineffective in starting forest fires (perhaps because the vast majority were launched in the winter or early spring) they were not harmless. 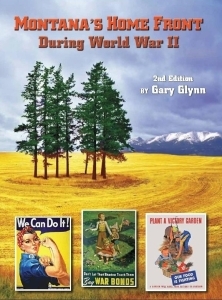 On May 5, 1945, a pregnant woman and five children were killed by a balloon bomb while they were on a church picnic near Bly, Ore. Other than this incident, the balloons caused only a few small fires and a minor power outage at the Hanford facility in Washington State, where ironically, plutonium for the first atomic bomb was being prepared. At least 35 balloons are known to have landed in Montana without inflicting any damage. Many of the bombs had unreliable triggers, and were duds. In western Montana, balloon bombs were discovered near Flathead Lake, Deer Lodge, Divide, Coram, Nyack, Sula, Glen, Dillon, Philipsburg, Boulder, Monida, and Babb. (A complete list can be found here.) Military aircraft from the Aleutians to Southern California pursued the balloons, and one enterprising Montana sheriff downed one with a shot from his hunting rifle. After the war the New York Times declared that “First prize for worthless war weapons goes to Japan, for her ‘unique origination’ of bomb-carrying balloons to spread fire and terror across North America.” Nevertheless, the balloons caused the only American casualties by enemy attack in the continental United States during the war, and may still be a threat today: A Japanese meteorologist has estimated that as many as 300 balloon bombs may still be scattered throughout remote areas of the West. A more complete account of this story can be found in Montana’s Home Front During World War II.